Most of you know at this stage that the German retailers Lidl and Aldi regularly sell fitness, sport and exercise equipment here in Ireland. I plan to review, critique, recommend various equipment if appropriate in the future. Yesterday I bought Lidl’s fitness brand “CRIVIT® Exercise Bars” for €34.99 in Stillorgan, South Dublin. Over the last year I got more and more into Body-Weight and Calisthenics, bought a set of Gymnastic Rings, Power/Resistance Bands, Arm-Straps for a horizontal bar to do leg/knee raises for Core-Strength etc.. Up to late November of 2017 I exercised only outside, enjoyed the fresh air, the occasional bit drizzle of rain (we are well used to that in Ireland 🙂 ), but mainly dry and sunny days. The above-mentioned equipment is generally fairly low priced and allows you to exercise independent of a gym out in the fresh air, which I love. You just have to find a chin-up or pull-up bar (or a sturdy tree branch) in a local park (you will find them in Cabinteely Park, Marlay Park, even in the Gallops), maybe use the horizontal bar of football / soccer goal to get started (that’s what I do in the Leopardstown Heights). I already searched for “Parallel Bar”, “Calisthenics Bar” or “Exercise Bars” on www.amazon.co.uk and www.amazon.de, but the prices and high postage and packaging fees put me a bit off. Some of the Supplied also don’t post to Ireland. For that reason, I was really happy to see Lidl offering these “Exercise Bars”. I plan to record an unpacking and assembling video of the bars later in the week or over the weekend, if time and weather allow. 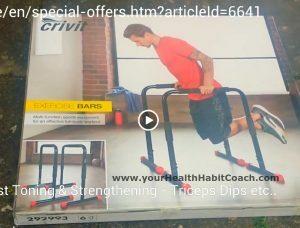 Here the link to the Lidl “Exercise Bars” / https://www.lidl.ie/en/special-offers.htm?articleId=6641 that I bought – you might have look at them yourself. Maybe wait until I reviewed them and let you know what the verdict is. Contact me if you have any questions or queries in relation to above or the fitness classes I offer in the Dublin 14, Dublin 16 and Dublin 18 area. This entry was posted in Fitness Equipment, Reviews and tagged Dip Bars, Exercise Bars, Exercise Equipment Review, Fitness Equipment Review, in Ireland, in South Dublin, Lidl Bars, Lidl Calisthenics Bars, Parallel Bars on January 30, 2018 by admini.